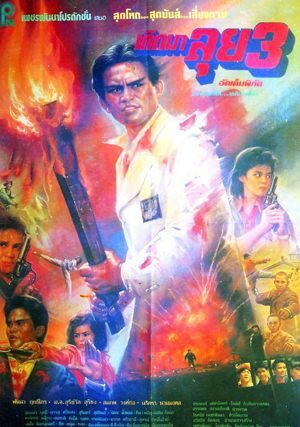 Thai movie เกิดมาลุย 3 was released in year 1990. It lasts 1h24mn. The first four minutes start with Panna Rittikrai presenting all actors and actresses in his movie. Panna kills a lawyer as he refuses to give him a testament. Afong (Suriwan Suriyong) is back from Hong Kong where she worked as lawyer assistant. Her former boss is dead and she gets death threats as she refused to forge a testament. 80% of the heritage goes to the daughter called Naen. Her former boss' new wife called Yen Feui wishes to get the whole heritage instead of only 20%. Wassana is the mother’s name but she died already. A relative, subdistrict headman Jaem, brought the daughter to Tha Bo in Nong Khai province. Ruffians from Hong Kong led by Panna Rittikrai and accompanied by two tough bald guys are also looking for the lost daughter. All those people including local ruffians meet in Tha Bo. Subdistrict headman Jaem is upset with Vinai, local ruffian leader. The local ruffians led by Vinai decide to kidnap Naen (หลาน) to pressure him to sell his land. Panna and his two bodyguards interrupt as they are looking for the daughter also. Of course multiple fightings happen between all of the three groups as they have different interest. Afong’s four friends take care of the two bald bodyguards and defeat them. Afong herself faces Panna Rittikrai through a fighting in white costume. She gets defeated. The four friends face Panna but gets defeated also. United, they finally defeat Panna through a daring final. The original movie features "Beat It" song from Michael Jackson but finally replaced by another music in the VCD certainly due to copyright issue. The movie ends up with some failed action sequences similar to Jackie Chan’s movies. เกิดมาลุย movie franchise is a full action movies series. Other actors are สมภพ วงศ์ก่อ (Sompop Wong Ko), นริศรา, บรรลุ, สุรินทร์, น้อย, กิม.